On November 8, 2016 I fell asleep around 10-11 PM after briefly tuning into the election coverage knowing I should’ve continued my Girl Meets World marathon instead. Although I wasn’t ecstatic as I’ve been in the previous presidential elections, I still felt a need to do my civic duty. I vote in every election no matter how big or small. The small people create laws and the big people pass and or veto them. I sat in bed sickened at how much “winning” Trump was actually doing. It shocked me but it didn’t come as a surprise, it was just a bit of a disappointment. We laughed at this man early on but we all knew this indeed was a possibility. The only thing I could compare such a feeling to was the day me and my best friend sat side by side in the University Student Affairs Office nervous to hear the Student Government election results. It was the first time in forever that my University had a democratic student government. We were rebuilding and when my bestie insisted I run alongside her as her VP I said yes because it scared me. I like change, I like helping people and I like to face my fears head on. As two black women at a predominately white, Catholic University, our platform was diversity. You would’ve thought we committed some kind of treachery or sin by even mentioning the “D” word. We gathered folks from all walks of life and asked if they wanted to join our cause. We dreamed of an environment where even the little voices had a platform. We didn’t want to just give out cookies and tee shirts we wanted to change the university for the better. We debated and campaigned our tails off going from dorm to dorm introducing ourselves to strangers and handing out our “vote for me” postcards. Statistically I knew winning was a longshot but we had to try. I had so many young white women stare me down and crumble the piece of paper before I could even explain what I stood for. Not once did I equate it to race. It wasn’t until the VP debate that I realized no matter how much research I did on the state of the university and how little my opponent knew about government, this wasn’t our election to win. My opponent was quite the airhead and I felt like I debated Plank from Ed, Ed, and Eddy but tis life, airhead still got applause. The applauses weren’t for what she stood for it was for what she didn’t. “This is the most racial tension we’ve seen on campus,” the director of Student Life explained to me and my best friend as we sat across from him. We knew before he even read the results that we hadn’t won but we hadn’t lost either because we had learned so much more about our peers than we knew before we started and university is about education after all isn’t it? Before college, I pictured racists as old men and women who were somehow holding on to their old fashioned values in “post-racial” America. It never occurred to me that values are either lost or fostered. They don’t just disappear. That day I did shed a tear knowing I had put in so much work to do something that terrified me but I loved helping people so I graciously accepted a senator role in the Humanities Department. It stunned me but it also prepared me for the unnecessary outrage when I designed our Black Student Union tee shirts that read “Black by Popular Demand.” They were definitely in high demand. We even had a few sales from white people who wanted them. All was well until on the final day we received a notice from Student Affairs that we had offended a lot of students who were upset that a White Student Union didn’t exist at this tiny Catholic Liberal Arts University. “Take the university name off or change the shirt completely,” was the ultimatum. We took the university name off, turned in the money to the printer, and unapologetically donned them together. For that large group of students the whole world is your white student union. One of our officers was a white girl and even she was a bit perplexed. That we did but sometimes your all isn’t enough even if you’re qualified, did the research, have all the right answers and voices. It’s funny how even today diversity scares people. I don’t know if it’s fear or history but eventually, hopefully we’ll live in the America that it’s supposed to be. While some people are enjoying the American Dream there are people from all walks of life living the American Nightmare. If anything the fear mongering should be reversed because America was founded on a bunch of white men stealing and killing life and land from the Native Indians. 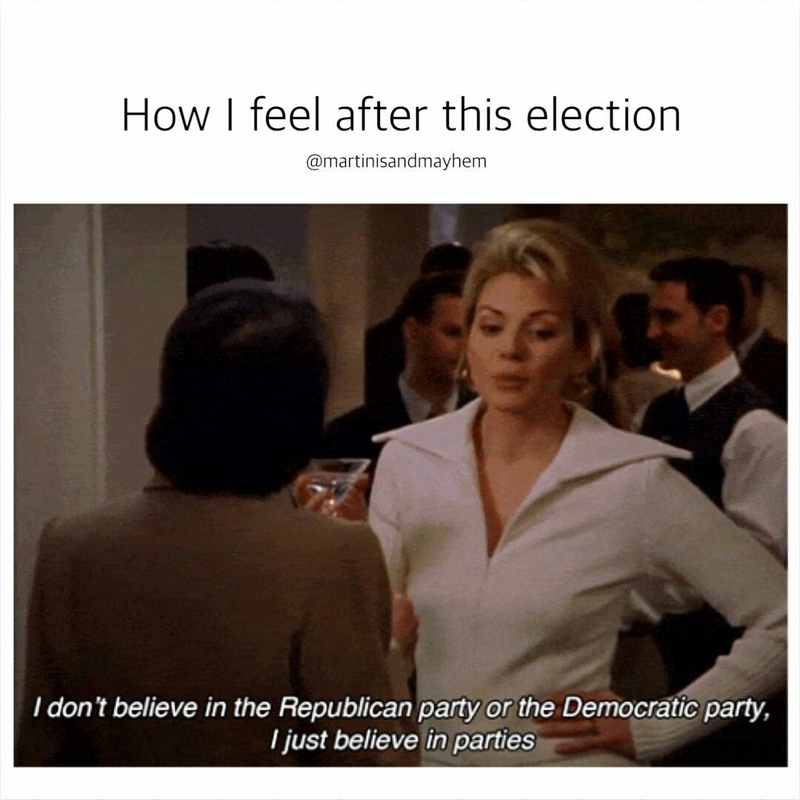 The night of the 7th I went to bed knowing Hillary was no Bernie but America would make due. America had come way too far to hand it to Trump and on the 8th I went to bed feeling as if I had a hangover yet I hadn’t had a sip to drink. For many years we were drunk off liberal politics and now we were to feel the effects of it unraveling. I was astonished at how very far we have to go to be a more Re-United States of America. Yesterday, I jokingly explained to my mom “he can’t be any worse than Bush.” But I hope he proves us wrong. Who knows maybe he’ll have an affair and get impeached or he’ll do so poorly that he accidentally unites the country. Or maybe just maybe he’ll surprise us all. I know, I live in a bubble the majority of the time surrounded by fiction, occasionally coming out for a dose of reality but a girl can dream can’t she? It’s obvious she can’t be the President of the United States but a woman can dream right?